Mobilink has started a new campaign with an aim to bring change, bring a meaningful difference in everyday lives, and rise above challenges. Through inspiring TVCs, which are largely liked by masses, Mobilink sees the catalyst for change in Pakistan’s greatest asset – its people. Mobilink plays an active role in supporting community and social development in Pakistan. Bringing a positive change in the communities, Mobilink is upheld by a belief that a company can only truly be successful when its values ensure a responsible and progressive population. Providing the matriculation curriculum via IVR to visually impaired students of the Punjab Matriculation Board. Very inspiring. All should do this for the country. we can make this a heaven with our efforts. i liked the ad very much. clear copy of karo mumkin campaign…!!!! 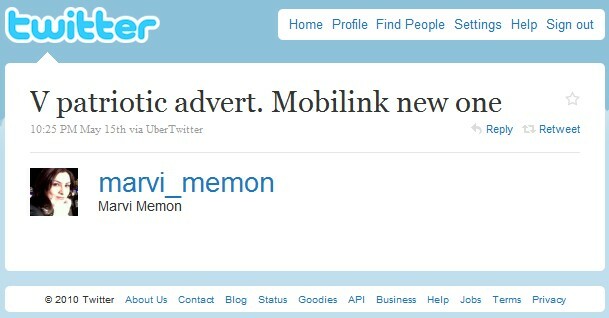 Mobilink seems impressed by Telenor Campeigns, they should come up with their own ideas. Mobilink should come up with something new and innovative and stop copying other operators. Khuch bhi hai, kisi ki bhi copy ho, but good steps, and motivational steps must be appreciated! Common guys… We won’t say anything if all companies start producing ads with girls and boys dancing.. Wouldn’t that be a copy??? At this time of calamity, I believe all companies in Pakistan should turn their focus to turn the direction of our beloved country towards prosperity… even if they would have to copy an idea of another…There would absolutely be nothing wrong in it…. Good Job Mobilink Much appreciated! At least there are companies in the country who thinks differently and beyond the business! it’s truly remarkable! I appreciate everyone playin his/her Role for a better pakistan Long live Pakistan!